Studio Ghibli's calling card and mascot, we might not first meet Totoro at the catbus stop, but it is here where we are truly introduced to him. Coming at about the halfway point in My Neighbour Totoro, Totoro is revealed not just as an invention of Ghibli's gorgeous art work, but also of its wit. Glimpsing his immense bulk from under her umbrella, Satsuki is then treated to a Totoro in love with the rain and the noise it makes on the umbrella she gifts him. It's a magic, near dialogue-less sequence, full of charm and it ends with the arrival of the Catbus; another Ghibli calling card, though this time to do with the studio's love of the absurd and a slightly naughty predilection for the innocently scary. Whilst Totoro then is iconic, My Neighbour Totoro did not for me feel as though it was Ghibli operating at the height of their powers. The recent The Wind Rises uses all of the absurdity and throwaway charm to tell a serious story which can be understood by both adults and children. My Neighbour Totoro is much simpler of narrative and spirit. The excursions of Satsuki, Mei and Totoro - with the latter arguably standing in as guardian whilst the children's mother is in hospital - are fun and slight, but never do they feel as though they threaten to do more than this, or to tell a more considered story. Perhaps, given the charm and humour here they won't need to for everyone, something My Neighbour Totoro's immense popularity suggests to be true, but I for one was disappointed that this wasn't a Ghibli film with more considered over-arching themes. I think it is also probably fair to say that Ghibli's later work has shown that advancements in technology can enhance, rather than destroy, their artistic animation. My Neighbour Totoro does look fantastic, but it lacks the smoothness of later films. Perhaps that is an unfair criticism - like picking apart the grain that some people prefer to be there on high definition transfers of 1970s films - but, for me, the visuals of The Wind Rises were Ghibli doing what they have done so well for a long time and then actually managing to improve upon their own good work. 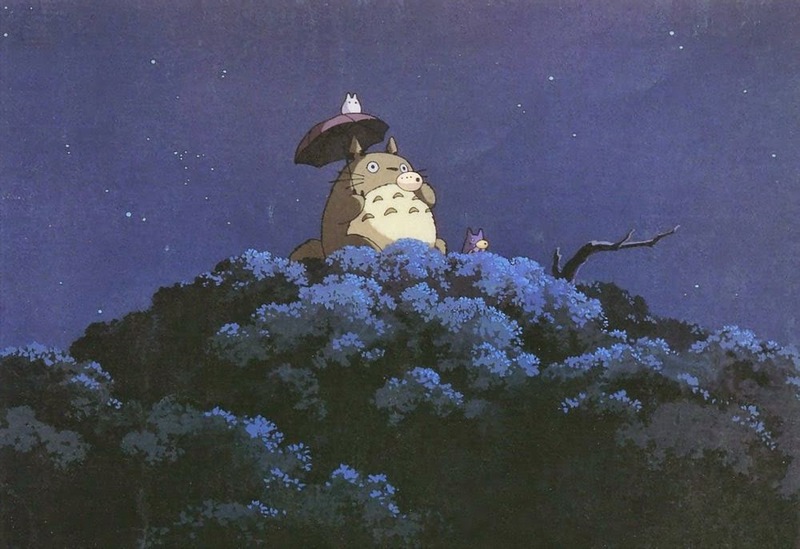 It is not surprising to learn now that My Neighbour Totoro's legend has grown as Ghibli's has. Reviewing a recent Blu-ray release, The AV Club pointed out that initial reviews called the film, amongst other things, 'relentlessly goody-goody'. Its programming in Japan, as a double-feature with Grave Of The Fireflies can only have helped to perpetrate that reading: whatever else Grave Of The Fireflies is, it is not 'relentlessly goody-goody'. Perversely then, there's a valid argument here that Totoro - ultimately a supporting character - actually saved My Neighbour Totoro from obscurity. Since plucked to the level of Ghibli mascot, he provides a reason to see a good, but not great film, a film during which he does not even show his face until the end of the first act, over one third of the way into the film. The character stands for everything great about Ghibli, and he is great, but the film in which he finds himself feels as though it is bettered by his presence only to the degree that it makes the film a good watch of an iconic character, rather than a great watch of an iconic film.